We’ve been hearing a lot lately about consumer cloud services. There’s Apple’s recently-announced iCloud, Amazon’s Cloud Drive, Google’s Music Beta (which is your music in the cloud) and, of course, Microsoft’s SkyDrive. All of these to one extent or another are moving away from simple online lockers, and we see that today with the release of the latest update to SkyDrive. The navigation is less clunky. Groups are now built in. Docs open up in online versions of Word or Excel, and can also be opened in the traditional desktop Office apps with edits syncing back and forth. But the biggest change is SkyDrive’s transition away from Microsoft Silverlight to HTML5 for all but a few remaining features (including a crucial one: uploading files). Photos and videos are all viewed with HTML5, which brings infinite scrolling of thumbnails and a new slide viewer. Videos now use the H.264 format and the video player is HTML5 instead of Silverlight . Microsoft has been stepping away from Silverlight for its web products the past few months, opting instead for the cross-platform compatibility of HTML5 and other “modern web” technologies such as CSS3. When you resize your browser, photo thumbnails also resize smoothly thanks to CSS3 transitions. And the original aspect ratios are maintained in the thumbnails, even for panoramic photos. 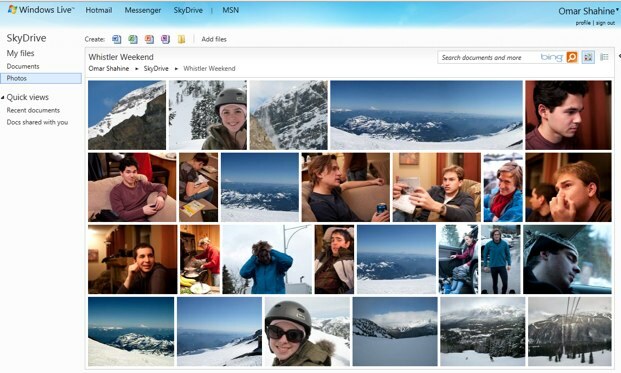 SkyDrive pulls docs, photos, and other files from other Windows Live services and brings them all together in one central location with a UI that is more front-and-center as opposed to being a background storage service for other products. Groups are now integrated and accesible from the left-hand column. The whole service is faster, taking better advantage of caching and hardware acceleration. A new information pane replaces what used to be an ad spot with hints and suggestions to help you dive deeper into the service. For all the improvements, SkyDrive still presents everything as though it is still in a traditional file system. You can view all your files, or broken down by type (docs, photos) or by groups. The file system is a relic of the PC and is something that Apple is moving away from with iCloud. On the other hand, at least it is a familiar metaphor most people can easily grasp. And there is no reason, SkyDrive can’t introduce new organizing principles over time (groups is already a first step).